1Joshua C. Luginbuhl, M.D., is an orthopaedic resident at Temple University Hospital in Philadelphia, Pennsylvania; 2Joey P. Johnson, M.D., is an orthopaedic trauma fellow at Brown Alpert Medical School in Providence, Rhode Island; 3Anthony Boniello, M.D., is an orthopaedic resident at Drexel University College of Medicine/Hahnemann University Hospital in Philadelphia, Pennsylvania; 4Mary K. Mulcahey, M.D., is an Associate Professor of orthopaedic surgery at Tulane University School of Medicine, New Orleans, Louisiana. Background: In orthopaedic surgery residency, traditional methods of education are being challenged by more technologically advanced modalities, specifically smartphone and tablet applications. Although these tools have become increasingly popular among orthopaedic surgeons, uncertainty remains about the widespread use of applications in orthopaedic residency. Aims: This study aims to evaluate the perception of orthopaedic residents regarding the use of applications to support their education and clinical decision-making. 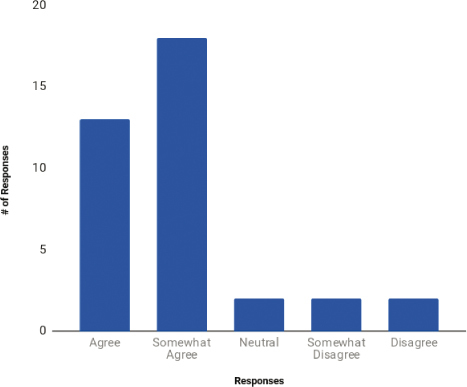 Methods: An anonymous, 25 question survey regarding the use of clinical and educational applications during residency training was distributed to 50 orthopaedic residents at two different ACGME-accredited programs. Statistical analysis was performed using two tailed t-tests for analysis of means, and chi-squared tests of independence of categorical variables, with significance defined as a p<0.05 a priori. Results: Thirty-seven residents (Response Rate: 74%) completed the survey. Most residents use a specific free orthopaedic reference application on a weekly basis (86.1%). Thirty-six residents (97.3%) believe that there is an educational benefit from medical applications, however, the majority of residents (54.05%) believe that senior physicians look down upon the use of applications during clinical practice. Over 90% of residents agree that the cost of an application affects the decision to download and use it. Conclusion: Most orthopaedic surgery residents use a wide variety of applications on a daily basis. Despite the increasing role of applications, the perception among residents that senior physicians look down upon the use of applications could be a barrier to widespread implementation. The American Board of Orthopaedic Surgery (ABOS) was established in February 1934 with the intention of creating a universal standard of education. By 1936, the ABOS instituted the first formal requirements for certification in order to monitor physician quality and to ensure public trust.1 In addition to the certification examination administered by the ABOS, the American Academy of Orthopaedic Surgeons (AAOS) developed the Orthopaedic In-Training Examination (OITE) to assess whether each orthopaedic residency program was attaining its educational goals. The establishment of the ABOS and the implementation of the OITE by the AAOS, led to high expectations for the quality of orthopaedic residency education. Previous studies have evaluated the types of resources that residents use to prepare for standardized examinations, specifically, traditional methods such as didactic lectures, case conferences, and textbooks.2 However, like many fields of medicine, orthopaedic residency education has changed rapidly as advancements in technology, specifically smartphone applications, have evolved. Despite the rapid expansion and use of available medical applications, questions remain about their safety, validity, and role in educational and clinical settings.11–14 Several recent studies have demonstrated that some orthopaedic applications, such as those that measure gait, range of motion, and degree of spinal deviation in scoliosis, are as accurate as more traditional measuring devices.15–20 While many applications have been thoroughly evaluated for accuracy, there remains a paucity of standardized testing protocols creating a wide variability in the usefulness, quality and accuracy of available applications. Ongoing uncertainty therefore exists regarding how the advancement of applications will affect traditional teaching in orthopaedic training programs. 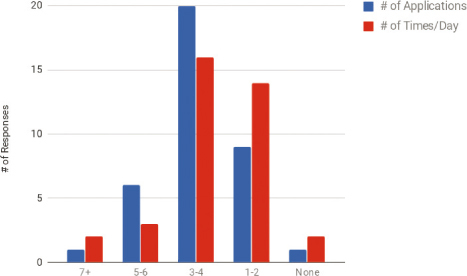 The objective of this study was to evaluate the perception of orthopaedic surgery residents regarding the use of educational and clinical smartphone and tablet applications to support their training and decision making. 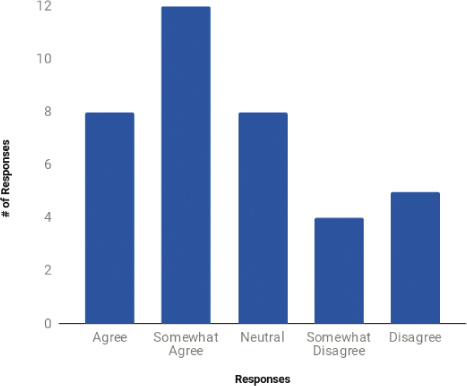 An anonymous 25-question online survey was formulated focusing on questions about frequency of application use, common barriers encountered, and opinions regarding application use during orthopaedic surgery residency (Appendix). The survey was distributed via Survey Monkey (SurveyMonkey Inc., Palo Alto, California, USA) to all current orthopaedic surgery residents at two university-affiliated residency programs in the United States (50 residents total). Demographic variables collected included current postgraduate-year and residency program. Eleven questions regarding use of applications and opinions toward application use were answered by selecting a categorical variable or by using a five-point Likert scale (“disagree”, “somewhat disagree”, “neutral”, “somewhat agree”, “agree”), while the remaining questions were answered by selecting a categorical variable (Appendix A) Participation was anonymous and voluntary, however, follow-up emails were sent to residents at 2 and 4 weeks to encourage more participation. Statistical analysis was performed using two tailed t-tests for analysis of means, and chi-squared tests of independence of categorical variables, with significance defined as a p<0.05 a priori. Outcome variables were statistically analyzed using data analysis software (StataCorp. 2015. Stata Statistical Software: Release 14. College Station, TX: StataCorp LP). This study (IRB ID: 1609004847) was approved by the Institutional Review Board (IRB) at the principal investigator’s institution* and complies with all relevant federal, state, and local regulations (* the PI was faculty at Drexel University College of Medicine at the time of IRB approval and initial manuscript submission, but is now a practicing physician at Tulane University School of Medicine). Thirty-seven residents (74% response rate) from the two orthopaedic surgery residency programs completed the survey. The number of applications and frequency of use varied, with the majority of residents using 1 to 4 applications (78.4%), 1 to 4 times per day (81.1%) (Figure 1). Thirty-two of the residents who responded (86.1%) use a specific free orthopaedic surgical reference guide application on a weekly basis. Smartphones are used more often than tablets for both educational (89.7%) and clinical (78.8%) purposes. Figure 1: Frequency of educational and clinical application use among orthopaedic residents. Thirty-six residents (97.3%) believe that medical applications provide an educational benefit and that they allow for improved efficiency in an educational or clinical setting. Only one resident (2.7%) believes that applications cannot be trusted to provide information for clinical decisions. Furthermore, four residents (10.8%) think that applications do not play an important role in clinical decision making (Figure 2). Two residents (5.4%) believe that their colleagues depend too much on applications. Twenty residents (54%) somewhat agree or agree that senior physicians “look down upon” application use during clinical practice. In addition, 17 residents (45.9%) believe that patients think less of a physician who uses applications during a clinical encounter, while 13 residents (35.1%) do not have this perception (Figure 3). There were no difference between junior residents (PGY1-3) and senior residents (PGY4-5) in trusting applications for clinical decisions (86.9% versus 76.8%, p=0.236, CI: -31.0-31.0), believing applications play an important role in the clinical setting (86.9% versus 78.6%, p=0.482 CI: -44.6-44.6), noticing an educational benefit of applications (100% versus 92.8%, p=0.250, CI: -22.8-22.8), believing that applications make them more efficient (100% versus 92.8%, p=0.213, CI: -21.0-21.0), and believing peers rely too much on applications in the clinical setting (21.7% versus 42.8%, p=0.410, -95.9-95.8) (Table 1). Table 1: Perception of the value of smartphone application use among junior (PGY1-3) and senior (PGY4-5) orthopaedic surgery residents. Thirty-four orthopaedic surgery residents (91.9%) agree that cost affects the decision to download and/or use an application and 22 respondents (59.4%) were willing to pay between $1-$10. Poor utility and design, along with high cost, were the most significant personal barriers to application use. Smartphone and tablet technology have become pervasive throughout society and reshaped the workplace across a variety of disciplines, including medicine. Applications designed for smart phone use are now common place in hospitals, with specialty-specific tools being used as a routine part of patient care.3,4,5,7,9 This study demonstrates that the majority of orthopaedic surgery residents surveyed use smart phone, or tablet applications in a clinical setting. Furthermore, only one resident surveyed did not trust the information provided in these applications and only two residents surveyed believed that their colleagues are too dependent upon applications. There were no statistically significant differences between junior and senior residents with regards to application use, or attitudes toward application use. Eighty-four percent of residents surveyed reported using the same clinical application on a daily basis. The educational guidelines for orthopaedic residency programs have become increasingly stringent in recent years, in an effort to standardize the quality of training provided to future orthopaedic surgeons.1 As the requirements become more exacting, the amount of time that residents are allowed to devote to patient care continues to decrease.21,22 In 2003 and again in 2011, the ACGME mandated increasingly strict guidelines limiting the amount of time residents can spend in the hospital taking care of patients, and learning in a clinical setting. By providing residents with a more facile way of accessing educational materials, applications may improve the ability of residents to augment the education they may be missing as their time in the hospital is increasingly limited.3 Additionally, applications that are focused on patient care, may help residents streamline the more time consuming aspects of clinical work, allowing them to spend more of their already limited time in the hospital actively engaged in educational endeavors. Although smartphone applications can improve educational and patient care opportunities, our study showed that more than half of our respondents believe that attending orthopaedic surgeons do not agree with frequent use of these tools. The present study is limited by its descriptive nature, and survey-based methodology. Additionally, the small group of residents (n = 50) surveyed may limit extrapolating broad generalizations of national and temporal trends. Conclusions extrapolated to national trends are limited as the surveys were completed by two urban teaching hospitals. It is possible that rural programs in the same state or region may have differing opinions regarding the role of applications in educational and clinical settings. A broader based survey querying a diverse group of programs around the country would be necessary to make more definitive conclusions of national trends. Additionally, we only surveyed trainees, thus we cannot comment specifically on the opinions of senior surgeons with regard to the use of smartphone applications. The present study did however experience a high response rate (74%). While conclusions should not be made on national trends, the study does demonstrate a substantial need to quantify the current usage of, as well as the present need to study the efficacy, safety, and accuracy of these applications. This study adds to the discussion of how technology can be used in the current medical and educational landscape in orthopaedic residency training programs. The vast majority of residents surveyed use applications on a regular basis and trust the content they provide. There were no significant differences in the attitudes towards applications between junior and senior residents. However, there was a perception by the majority of respondents that senior orthopaedic surgeons look down upon the use of applications. The use of applications by orthopaedic surgeons and the number of applications available continue to increase.10 The current study speaks to the potential utility of applications in orthopaedic training; however, further studies are needed to determine the optimal use of applications in clinical and educational orthopaedic settings. 2. Miyamoto RG, Klein GR, Walsh M, et al. Orthopedic surgery residents’ study habits and performance on the orthopedic in-training examination. Am J Orthop 2007;36:185–188. 3. Franko OI and Tirrell TF. Smartphone app use among medical providers in ACGME training programs. J Med Sys 2012;36:3135–3139. 4. Abboudi H and Amin K. Smartphone applications for the urology trainee. BJU Int 2011;108:1371–1373. 5. Brewer AC, Endly DC, Henley J, et al. Mobile applications in dermatology. JAMA dermatol 2013;149:1300–1304. 6. Wolf JA, Moreau JF, Akilov O, et al. Diagnostic inaccuracy of smartphone applications for melanoma detection. JAMA dermatol 2013;149:422–426. 7. Zvornicanin E, Zvornicanin J, and Hadziefendic B. The use of smartphones in ophthalmology. Acta Inform Med 2014;22:206. 9. Franko OI. Smartphone apps for orthopaedic surgeons. Clin Orthop Relat Res 2011;469:2042–2048. 10. Andrawis JP, Muzykewicz DA, and Franko OI. Mobile Device Trends in Orthopedic Surgery: Rapid Change and Future Implications. Orthopedics 2016;39:51–56. 11. Ozdalga E, Ozdalga A, and Ahuja N. The smartphone in medicine: a review of current and potential use among physicians and students. J Med Internet Res 2012;14:128. 12. Skomorowski M, Jordan K, Schroeder K, et al. Resident impressions of the clinical utility and educational value of the iPad. J Mob Technol Med 2013;2:21–26. 13. Wong SJ, Robertson GA, Connor KL, et al. Smartphone apps for orthopaedic sports medicine–a smart move? BMC Sports Sci Med Rehabil 2015;7:1. 14. Buijink AW, Visser BJ, and Marshall L. Medical apps for smartphones: lack of evidence undermines quality and safety. Evid Based Med 2013;18:90–92. 15. Jenny JY. Measurement of the knee flexion angle with a smartphone-application is precise and accurate. J Arthroplasty 2013;28:784–787. 16. Jenny JY, Bureggah A, and Diesinger Y. Measurement of the knee flexion angle with smartphone applications: which technology is better? Knee Surg Sports Traumatol Arthrosc 2015;24:1–4. 17. Werner, BC, Holzgrefe RE, Griffin JW, et al. Validation of an innovative method of shoulder range-of-motion measurement using a smartphone clinometer application. J Shoulder Elbow 2014;23:275–282. 18. Furrer M, Bichsel L, Niederer M, et al. Validation of a smartphone-based measurement tool for the quantification of level walking. Gait Posture 2015;42:289–294. 19. Meislin, MA, Wagner ER, and Shin AY. A Comparison of Elbow Range of Motion Measurements: Smartphone-Based Digital Photography Versus Goniometric Measurements. J Hand Surg 2016;41:510–515. 20. Franko OI, Bray C, and Newton PO. Validation of a scoliometer smartphone app to assess scoliosis. J Pediatr Orthop 2012;32:72–75. 21. Camp CL, Martin JR, Karam MD, et al. Orthopaedic Surgery Residents and Program Directors Agree on How Time Is Currently Spent in Training and Targets for Improvement. Clin Orthop Relat Res 2016;474:915–925. 22. Mir HR, Cannada LK, Murray JN, et al. Topics in Training Opinions of Resident Duty Hours. J Bone Joint Surg 2011;142:1–9. Which of the following do you use most for applications related to education? Which of the following do you use most for applications related to clinical practice? How many applications do you use for education or as a clinical tool? On average, how many days/week do you use applications? On average, how many times/day do you use applications? Applications allow me to be more efficient in a clinical or educational setting. I believe that applications act as a crutch for education. I trust basing medical decisions on information provided by an application. I think my colleagues depend on applications too much. I think applications play an important role in clinical decision making. I feel that older physicians look down on application use during clinical practice. I feel that patients think of a physician differently if they use an application during a clinical encounter. I feel comfortable using my smartphone/tablet. The amount of memory an application uses affects my decisions to us/download it. I use an application less if it uses a significant amount of battery life. The cost of an application affects my decision to download/use it. What is the maximum price range you would be willing to pay for an education/clinical application?